Microsoft Excel VBA and Macros Training - Atlanta, GA and Online | ProbizTechnology.com. This Microsoft Excel class explores Macros and VBA (Visual Basic for Applications). Are you a Microsoft Excel Power user looking to take your skills to the next level? Would you like to learn ways to automate tedious MS Excel tasks? Creating Excel VBA Functions and Subs. Using Excel VBA to loop through rows. Can't attend? Want us to bring this course to your site? We offer affordable, customized training for groups of as few as 4 people. Contact us or call 770.498.7333 for details. (Customization is available for an additional fee). 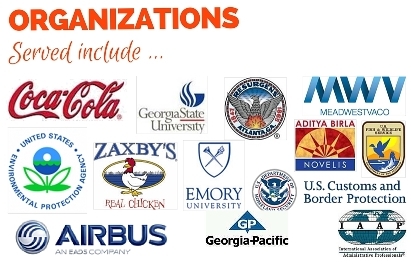 We've provided training for employees of some of the best known brands in the United States (and the world). This Advanced Excel course, Excel VBA, requires Intermediate to Advanced level knowledge of MS Excel. Please bring your laptop (or let us know if we need to provide one). Please click here, email training AT probiztechnology DOT COM or call 770.498.7333. To contact us please click here, email training AT probiztechnology DOT COM or call 770.498.7333. If instructor cancels class, students will be issued a full refund. If a student cancels registration, at lease one week prior to class, instructor will issue a refund less $20 or 15% administrative fee, whichever is greater. No refunds will be issued if student cancels within a week of class; student will be issued a credit.